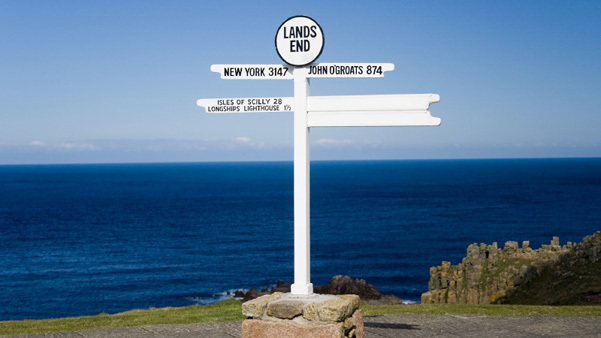 The South West Coast Path is 630 miles in total, covering a vast, everchanging stretch of the English coastline. While it would be a dream to walk the entire route in one shot, for many people this is simply not possible. So for this reason we have split the route down into sections that are a little more achievable, meaning that you can walk one or two of them at a time and cover the distance of the whole route over a number of visits. But which of these is the best for you? Section 1 – Minehead to Westward Ho! The paths on this section take you along the highest coastline in Britain past unnatural seeming rock formations in the Valley of the Rocks, said to have been sculpted by the Devil himself! This part of the route also incorporates the Tarka Trail; a series of footpaths that follow the route taken by Tarka the Otter in the book by author Henry Williamson. The trail gently meanders down from the coast to a lower level, passing marshland and nature reserves so you can enjoy the abundance of plants and wildlife. The trail varies every step of the way swooping down from high cliffs to secluded coves, meandering through pretty villages and crossing vast sandy beaches. There are some really remote sections on this part of the path, where you will find waterfalls spilling into the Atlantic while seabirds wheel above your head. There is a small section on this route considered to be the toughest on the whole SWCP, so beware! 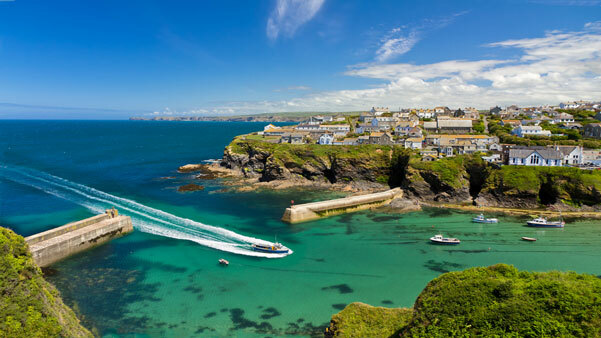 You can also visit the historical site of Tintagel, a place which is not only inexorably linked to the legend of King Arthur, but also more Roman pottery has been excavated from here than the rest of the UK put together. Bedruthan Steps, sea stacks, dramatically rising from the sea. All of these things and more await you on this section of the SWCP. It may be a short distance, but this is a fairly demanding section of the route. This is wild coastal walking at its finest. The seas are rough, as is some of the terrain, but the views are stunning taking you through two different Areas of Outstanding Natural Beauty. 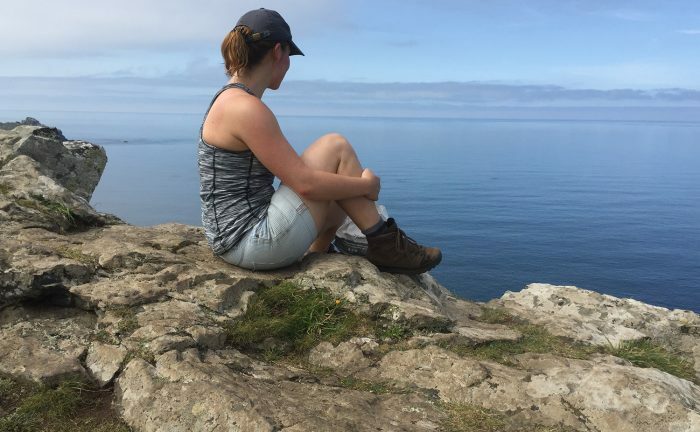 Wild flowers on the cliff tops and turquoise seas with golden beaches dominate with fantastic views, plenty of birdlife and delicious seafood all to be found on this 40 mile stretch of coast path. 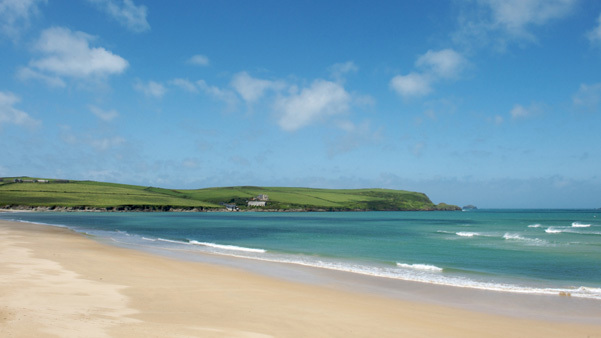 Due to the sub-tropical conditions, this area of Cornwall is a botanist and nature lover’s paradise. 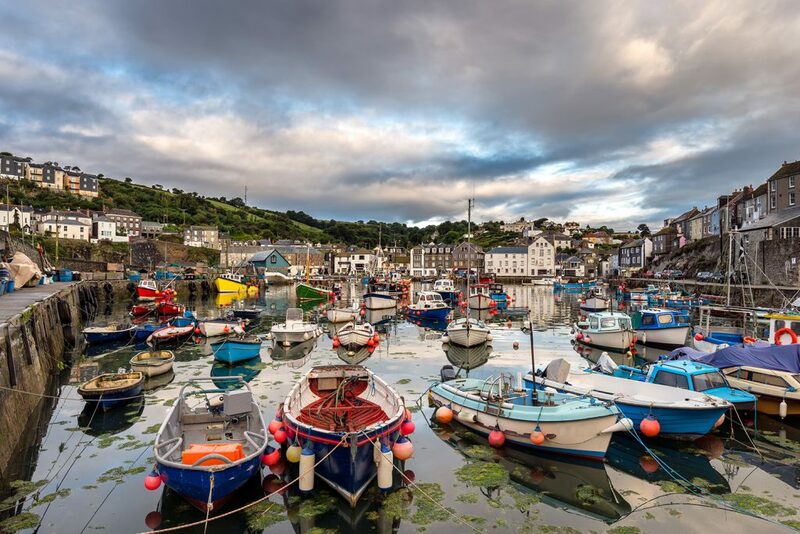 See nature at its finest, with an abundance of rare wild flowers and basking in the turquoise waters of the English channel, spot basking sharks and grey seals. 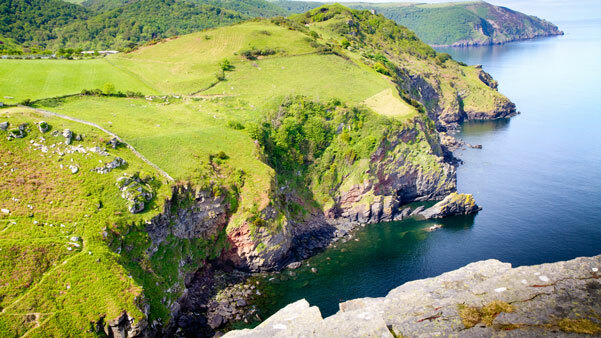 The trail follows rugged cliff tops taking you past deserted coves and whitewashed cottages. 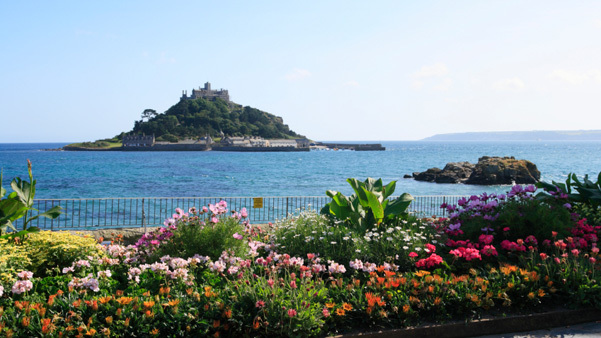 Pass St Michael’s Mount which is linked to the mainland by a cobbled causeway and see Loe Pool, Cornwall’s largest freshwater lake. If you are a lover of all things Flora, then this is the section for you. Not only is there a load of natural splendour on display, but you can also build time into your trip to visit the Lost Gardens of Helligan and the otherworldly Eden Project. Caerhays Castle with its glorious gardens and Charlestown, a pristine example of a Georgian working Port. Start in Plymouth, walking along the Waterfront Walkway, along the vibrant, historic streets of the largest city on the South West Coast Path. 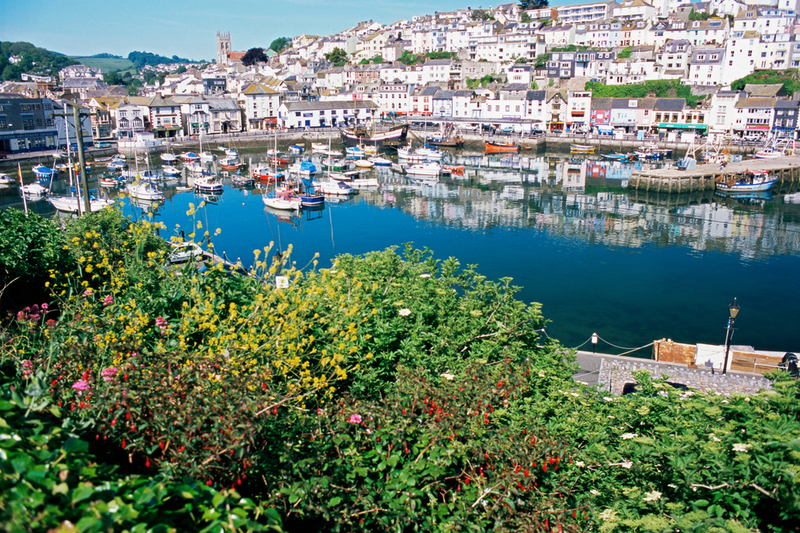 From there you are straight into an Area of Outstanding Natural Beauty and on your way to Brixham. This section is often overlooked but offers some of the best walking and views on the whole route, and because of this it is one of the quieter sections too. Much of the route is owned by the National Trust and there are many Areas of Outstanding Natural Beauty along this stretch. While the crowds flock to the routes around the point, this is the one that I would recommend the most. This is the only section that we are unable to sell. There are difficulties surrounding the ferry times and the tide times on this walk which make it logistically difficult for us to sell. There are also some restrictions on the accommodation along the route. 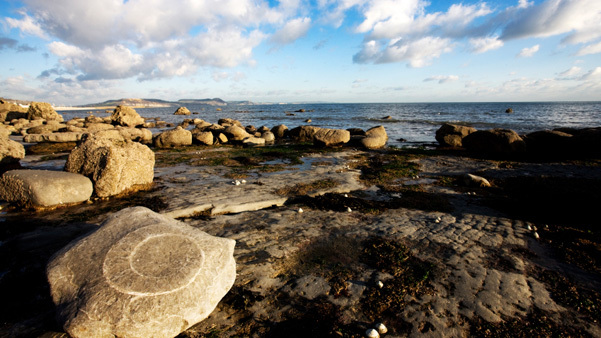 Geoneedle at Orcombe Point marks your entry to the Jurassic Coast. The needle is constructed from all the varieties of rock found along this stretch of coast which include striking red Triassic earth and stark, white chalk cliffs. You will spend much of one of the days walking through the Undercliffe National Nature Reserve, thick, tropical seeming vegetation which has grown on natural landslides. It is an outstanding experience and completely different to anything that you will find on the rest of the coast path. This section is beautiful. Again we are in Area of Outstanding Natural Beauty territory, but on this section you will see the stunning views of Chesil Beach and the Fleet Lagoon with its turquoise waters and abundant wildlife. 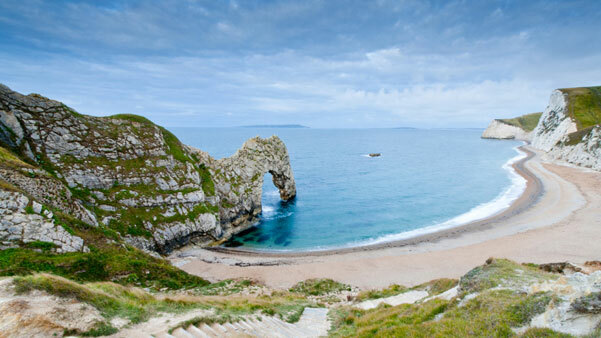 High white cliffs frame pastel golden sands and make sure you take some time to check out Durdle Door, a beautifully preserved sea arch near Lulworth. The rest of the trip is a rollercoaster of ups and downs, all surrounded by the natural wonder that you will be used to seeing on the SWCP, before arriving in South Haven Point and taking a ferry up to Poole for your final night.